Chapter Twenty-Two: "Hot to Trot"
Adapts "Gatomon Comes Calling" and "The Eighth Child Revealed"
Chapter Twenty-Three: "Victory and Defeat"
Adapts "The Eighth Child Revealed" and "Out on the Town"
Gatomon begins to remember her past - how she was waiting for someone who never came, how she met Wizardmon, and show fell under Myotismon's rule. Wizardmon knows that Kari was the one she was waiting for, and when he takes her Gatomon to her and gives her the eighth Digivice, the truth is at last clear - Kari is the Eighth Child, and Gatomon is her Digimon. Tai is also convinced of this when Agumon moves to attack Wizardmon, and Gatomon protects Kari, and Wizardmon and Gatomon head to Myotismon's crypt to retrieve Kari's Crest. Tai and Agumon follow them, running into Matt, T.K. and their Digimon along the way, who have befriended Pumpkinmon and Gotsumon, two other members of Myotismon's army whose hearts aren't in it. They all rush to the scene of Myotismon's battle with Gatomon and Wizardmon, but are too late to stop Wizardmon being tossed into the bay. Myotismon turns on them, destroying Pumpkinmon and Gotsumon, and then departs, with Gatomon as his captive. Adapts "Flower Power" and "City Under Siege"
Adapts "Prophecy" and "The Battle for Earth"
Chapter Twenty-Seven: "Enter the Dark Masters"
Adapts "The Battle for Earth," "Enter the Dark Masters" and "Seasick and Tired"
A column of light emerges from the sky, and pulls the DigiDestined - with Kai, this time - back into the DigiWorld, which, they discover from Chuumon, has been conquered by the so-called "Dark Masters" - MetalSeadramon, Puppetmon, Machinedramon and Piedmon. The Masters waste no time in meeting the children, teleporting them to Etemon's stadium, where Piedmon easily defeats WarGreymon and MetalGarurumon, and kills Chuumon with a dagger meant for Mimi. There is no time to mourn his loss, however, as Piximon suddenly appears to cover the kids' retreat, sacrificing himself for their safety. Winding up on a beach, the kids quickly fend off attacks from Shellmon and Scorpiomon, and then MetalSeadramon himself attacks them, pursuing them out to sea. Adapts "Under Pressure" and "Playing Games"
The events of most of "Out on the Town" are omitted (but, as with omitted events in previous volumes, apparently still occurred in the manga continuity), and the conclusion of the episode is re-written to connect with the conclusion of "The Eighth Child Revealed." The population of Odaiba isn't gathered in the convention centre, hence Mimi and Sora don't wind up there, and there's no escape plan - the fight with DarkTyrannomon is just one of several in the streets of the city. Myotismon does not dispose of DarkTyrannomon, nor does he fight or injure Lillymon. Joe and T.K. are not stuck outside Odaiba - they're already in the district when the fog comes down, and take to the bay to fight MegaSeadramon. Izzy doesn't separate from the rest of the team to investigate the TV station; he just heads there along with everyone else. Similarly, Matt's dad doesn't appear in the manga, so anything relating to him isn't here. Joe and T.K. arrive late to the battle with Myotismon, rather than showing up at the start with Wizardmon. They don't need to show up at this point because Wizardmon isn't required to heal Lillymon, since she never got hurt. The events of "Prophecy" are trimmed down, to just the reading of the prophecy, the chanting of the sleeping adults, and the Mega Digimon appearing. The prophecy is recited verbatim from the anime dub (right down to the "please always recycle" line). In a minor change, it is MetalGreymon and WereGarurumon who Digivolve directly to their Mega forms, rather than Warp Digivolving from Agumon and Gabumon. VenomMyotismon is not restrained by the power of the Crests - WarGreymon and MetalGarurumon just take him down, yo. Besides the appearance of the DigiWorld in the sky and the kids returning, the other events following VenomMyotismon's defeat in "The Battle for Earth" are dropped. Specifically, no crashing plane is saved (which means Cody can never become a DigiDestined! Aaah!). Rather than attack the DigiDestined separately, as they did in the anime, the Dark Masters attack them all at once, bringing them straight to the stadium (which I had never realised was Etemon's from "The Arrival of Skull Greymon" in the anime). Most of "Seasick and Tired" (specifically, the battles with Shellmon and Scorpiomon) is just recapped on one page. In the anime, the kids and Whamon take a break after escaping from MetalSeadramon, and this is when Tai does his fishing. They then hide underwater when they learn the Divermon are after them. In the manga, they hide underwater after the escape, and Tai fishes after the Divermon are dispatched. Up until this point in the manga, WarGreymon has not used his spinning tornado attack. It is Whamon's Tidal Wave that influences WarGreymon to try a spinning attack. 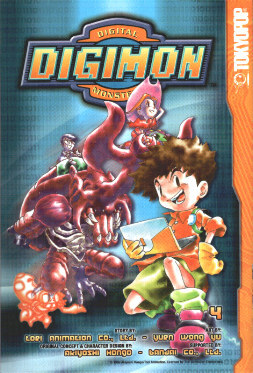 In the anime, Salamon was captured by Myotismon, then Digivolved into Gatomon, and met Wizardmon when she was searching for troops for Myotismon's army. Well, the manga alters this, making it so that Salamon became Gatomon, then met Wizardmon, and then they were both captured by Myotismon. There's nothing wrong with this, and I would have listed it above, except in the chapter prior to this revelation, we see *Salamon* being beaten by Myotismon, which is in accordance with the *anime* timeline, rather than the altered manga one. Lillymon's Flower Cannon is consistently mistakenly referred to as "Flower Wreath." When Whamon comes to rescue the kids, his silhouette appears, but the manga infers that he is *above* the kids, casting his shadow on them, when in fact - as in the anime - he's underwater, below them. It's a fair mistake to make, though, since, in an art mistake, Zudomon is coloured darker, as if a shadow is being cast on him, but the beginning of the next chapter clearly shows Whamon breaking up through the waves. When MetalSeadramon has WarGreymon in his jaws, Whamon smashes into him, free him. However, when this happens in the manga, MetalSeadramon remarks "Never mind. You're not worth it," as if he had *chosen* to dismiss WarGreymon by letting him go, which he didn't. Sora refers to Phantomon as "Casper" - a reference to cartoon character, Casper the Friendly Ghost.